In order to understand this condition, let’s talk a bit of anatomy first of all. The anatomists made this one pretty simple for us. 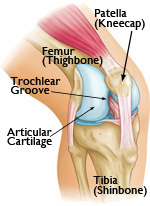 Petello refers to the patella or kneecap (the small circular bone on top of the knee joint). Femoral refers to the femur – the long upper leg bone. So, patellofemoral pain is simply pain between those two bones, the patella and femur. So what is patellofemoral pain? Though not fully understood, the most current accepted theory as to what brings on this type of pain is called the patella malalignment/maltracking theory. Again, to understand better why things go wrong, lets go back to the anatomy. Our knee caps have a happy place when it comes to positioning, which is centered right in the groove of the femur. Because of where the kneecap sits in the groove, underneath the powerful quadriceps muscles, the kneecap has to bear an incredible amount of pressure. If the positioning is off, (too high or too low) the pressure from the quadriceps pushes the kneecap into part of the femur where it shouldn’t be, and pain results. Tracking issues work similarly. Usually tracking is off to the outside of the leg, pushing the kneecap into the outer ridge of the femur, causing increased pressure and pain. The pain with PFP is usually localized somewhere around the kneecap (sides, top, underneath), and usually comes on with increased activity, such as using stairs or running. Also, the pain can increase with long periods of sitting in one position. As with anything in the human body, PFP is complex. It is frustrating for the patient, because it significantly limits activity. Again, according to JOSPT, about 74% of those with PFP will significantly limit their physical activity for 5 years. It is also a challenging diagnosis for the therapist, because a painful patellofemoral joint can have multiple contributing factors. From the feet, to the knee joint itself, and on up to the hips and pelvis, a weakness in these areas is thought to contribute to causing PFP. As a result, it is important that your therapist be thorough when evaluating your PFP. PFP research has come a long ways in recent years, and there are a lot of good conservative treatment approaches specific to the individual patient. With a good focused, consistent treatment approach, I have seen a lot of success in treating PFP. At the Fit Stop, we are up to the challenge of treating your patellofemoral pain! Stop by today at any of our convenient Fit Stop locations if you suspect PFP. For an athlete or anyone just trying to keep active, PFP is a very frustrating condition that can significantly limit ease of mobility for a long period of time, especially if left untreated. Fortunately, here at the Fit Stop we are here to help, and there is a lot that can be done to treat your PFP. So what do we do about it? PFP is a complex condition; an in depth evaluation from one of our skilled therapists is the most helpful to build a plan of treatment that is based on your specific needs. However, some of the more common and successful treatment approaches focus on therapeutic exercise for muscle weakness or imbalance in the hips and thigh muscles. For example, when I treat this kind of pain, I almost always find that there is some decreased muscle strength in the hip muscles that lift the leg to the side and/or rotate the hip away from the body. Weakness in these muscles can result in poor control at the knee joint, thus putting the knee in an awkward position during activity, resulting in increased force and pressure on the patellofemoral joint. Another important treatment example for this kind of pain is the hands on stretching of the kneecap itself. Again, from my experience most folks with this kind have pain have a tight kneecap (it doesn’t move like it should). The kneecap normally should slide and tilt pretty easily if you take your hands and try to move it around. Manually taking the kneecap and stretching it (though painful at times), can help decrease the pressure on that joint and over time help reduce pain. There are other factors, exercises, and treatments to consider when evaluating and setting a treatment plan for your specific PFP. Because of the complexity of the human body, please keep in mind that this home exercise program may not be exactly right for you. However, these are generally a good, safe place to start if done properly. As always, if you have any questions, contact us anytime or stop right in to your convenient Fit Stop location. Click on this link of the picture below to download this file! You don’t have to live with patellofemoral knee pain. 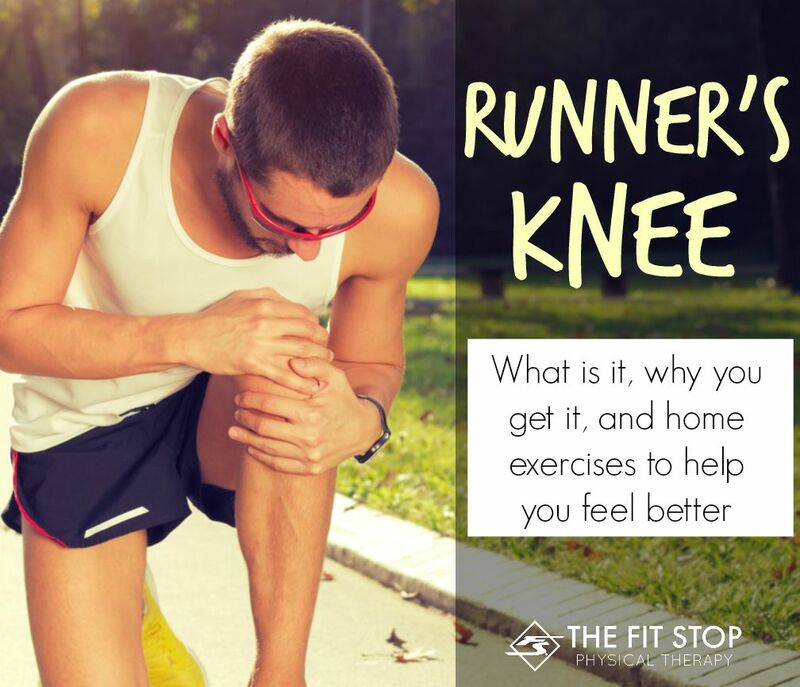 There’s a lot that you can do to stretch where things are tight, strengthen where things are weak, and ultimately help your knees to feel much better! We would love to try to help you out even more! Our therapists specialize in movement mechanics and dysfunction. You will benefit from coming and consulting with our therapists about your pain. Click one of the links below to be taken to the contact information for the clinic closest to you! I thought my knee pain was caused by my knee itself – how wrong I was. Now I know why people with pains like that go to physical therapists – they need their education and expertise to diagnose what’s actually causing the pain and help them strengthen the weak links. I hate that I can’t run and exercise without long breaks in between to recover so I’m definitely going to find a PT and start working on fixing the problem! Thanks for talking about this! What a kind comment; thanks so much, Tara! We hope this info is useful in helping you to achieve your goals.